Complete Poultry fencing kit. Keep birds in - keep pests out! Electric fencing for poultry is a effective method of containing both domestic and commercially kept chickens, turkeys, ducks, geese, and can also be a big deterrent to predators such as foxes. Complete kit to erect temporary poultry containment, 112cm tall by 25m long. Green colour blends unobtrusively with yard or garden. Deter predators. 8 posts with double steel spikes for greater stability. 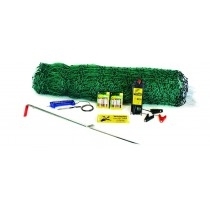 Kit includes ESB150 battery-operated energiser, batteries, earth stake, corner pegs, crocodile clips and repair kit.